Born at Bangalore, East Indies c.1828-1834. See below for possible year. 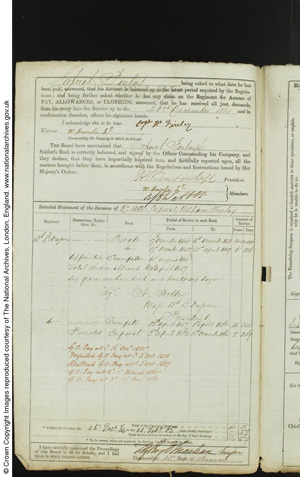 Enlisted at Dublin on the 17th of December 1846. William Finlay, aged 19, Private soldier, born Bangalore, East Indies. Sent to Scutari on the 26th of September and rejoined the regiment on the 3rd of October 1854. At Scutari again from the 15th of January until rejoining the regiment on the 3rd of February 1855. 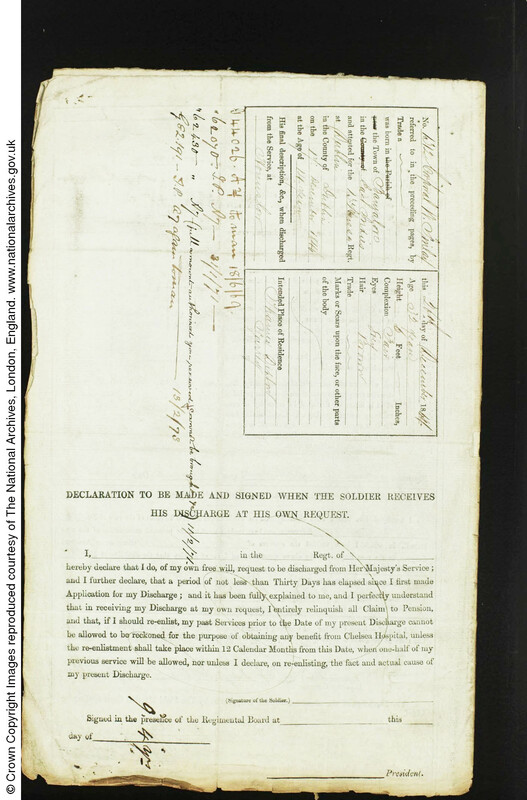 If this is the right record, William Finlay, son of John Finlay, married Harriet Hargrave, daughter of Alexander Hargrave, at Dundalk, Louth, Ireland, on 12th November 1858. The record offers no corroborating additional info, such as the age or provenance of the bride and groom, but this seems likely to be the right William and Harriet. There was, and still is, a military barracks at Dundalk, used originally as a cavalry and artillery barracks, and now named Aiken Barracks. "Unfit for further service. - Has chronic rheumatism. Suffers much also from bronchitis, but it would not hinder him from earning a livelihood. Jocks Lodge, Leith South, Midlothian. William Finlay, aged 28, Soldier Corporal, 13th Light Dragoons, born Bangalore. Harriett Finlay, 22, born Ireland. Served 14 years 190 days. In Turkey and the Crimea, 2 years. Character and conduct: "very good". In possession of 3 Good Conduct badges. Five times entered in the Regimental Defaulter's book. Never tried by Court Martial. Awarded a pension of 9d. per day for four years. Aged 32 years on discharge. Letters regarding pension to the 13th of February 1873. William Finlay's discharge papers, Hounslow, 1864. Intended place of residence after discharge, Thames Ditton, Surrey, but he later moved to Manchester. William Finlay, aged 37, born East Indies. Harriett Finlay, 31, Laundress, born Ireland. Edgar Finlay, 3, born Hulme, Lancashire. James Henry Finlay [son], September Quarter 1874, Salford. William Finlay, aged 49, Warehouseman, born East Indies. Edgar William Finlay, 13, Salford. James Henry Finlay, 6, Salford. 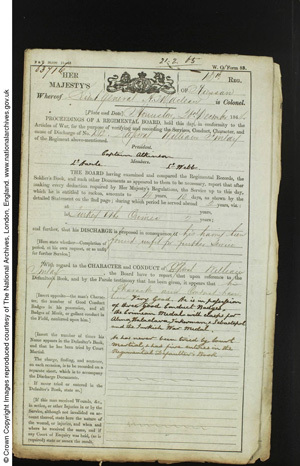 William Finlay, aged 48, December Quarter 1881, Salford. 31, Dorset Street, Salford [as per 1881]. Harriet Finlay, aged 51, widow, Laundress, born Ireland. James H. Finlay, 16, Errand boy, born Salford. Edgar William Finlay [son] married Ada Black, December Quarter 1890, Chorlton. Edgar W Finlay, aged 23, Painter, born Manchester. Ada Finlay, 26, born Manchester. Harriet Finlay, aged 58, December Quarter 1897, Salford. 59, West Craven Street, Salford. Edgar W Finlay, aged 34, House Painter, born Manchester. Ada Finlay, 36, born Manchester. Harriett, 9; Charlotte, 7; Edgar W, 6; Ada, 1. Isabella Black, sister in law, 40, is also shown. 107, Tatton Street, Regent Road, Salford. Edgar William Finlay, aged 45, House painter and shop keeper, born Salford. Ada Finlay, 46, Assisting in business, born Manchester. Harriet, 19; Charlotte, 17, Edgar William, 16, Ellen, 8. One boarder is also shown. Edgar W Finlay [son], aged 83 years, March Quarter 1950, Salford. 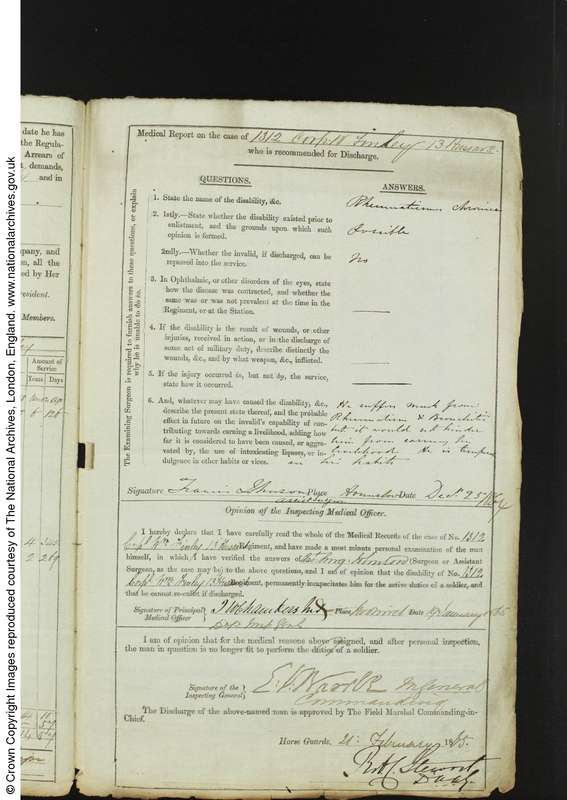 Birth, marriage and death registrations, & Census information for 1851 - 1911, kindly provided by Chris Poole. 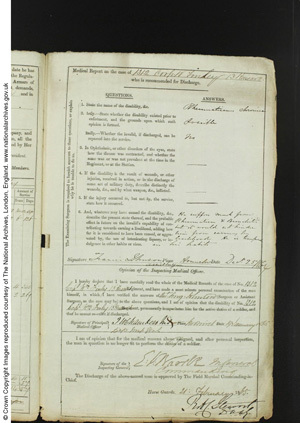 In September 2014, the EJBA was contacted by Alan Finlay, with information about his great-grandfather William Finlay. 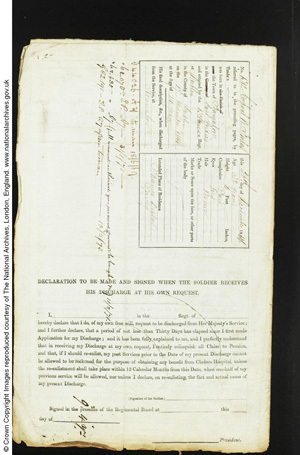 We are very grateful to him for providing images of WF's discharge papers. In July 2018, the EJBA was contacted by Pauline Taylor ("great granddaughter of William Findlay by his second son") asking to be put in touch with Alan Finlay.